The possibility to access samples from one side only make the Compton scattering based techniques a powerful method for NDT in medicine, in industrial applications, as well as to inspect fresco's substrates in the field of cultural heritage conservation. 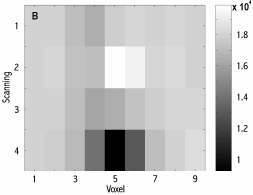 In the present paper, a new Compton imaging approach based on a combination of an experimental set-up, and a multivariate analysis of data is introduced in order to describe the density variation and the elemental composition in hidden layer of large size. An original backscattering configuration of the set-up, where source and detector are on the same axis, has been studied and applied to obtain a fast voxel-by-voxel scanning of a large surface, while the electronic density of the layer is described by the simultaneous analysis of the total number of backscattered photons (the Compton integral spectrum), collected for all the inspected voxel. 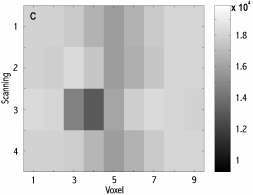 The correlation analysis of the back scattered photons coming from neighboring voxel, has been performed in terms of Principal Component Analysis (PCA), to describe the electron distribution of a Plexiglas layers with a hole and some inserts of different materials. It has been experimentally proved that the density distribution of a homogeneous material can be simply represented by a single PC even in the presence of a flaw. Moreover, the statistical analysis allows to describe the layer's elemental composition in terms of binary compound, two PCs, at one time. The possibility to access large samples from one site only, makes the Compton scattering a powerful method for non-destructive testing (NDT) in application both to industrial examination and to conservation of cultural heritage, where the characterisation of hidden defects at early stages can prove critical in planning the consequent remedy . The relevant concept is based on the detection of the scattered radiation produced from a collimated beam aimed at the object. The reflected signal provides a measure of the electron density of the material within the sensitive volume (SV) under test. Therefore, Compton scattering enables the detection of local defects and the discrimination between material of different density and composition. Many reported techniques [2,4], define the voxel to be inspected, the SV, by overlapping a well-collimated beam of incident photons with the view angle of a collimator detector. However, in the energy range of covered by this techniques the photons scattering processes is weak, and the voxel by voxel scanning may results time consuming and cumbersome. This limitations represent one of the principal drawbacks to the Compton scattering imaging of large object, and some optimization of the experimental configuration was attempted to improve the technique; for instance by renouncing to the detector collimation and viewing the entire sample ; or by using an enlarged azimuthal collimation to maintain the voxel-by-voxel scanning . As detailed in a recent paper , a further improvement may be obtained by a multivariate analysis approach of the measured data, based on the principal component analysis PCA [8,9]. Indeed, it has been shown that a detailed description of the layer density may be obtained by the simultaneous analysis of all the Compton scattering spectra detected by the inspected SVs. In the aim to apply the Compton scattering to imaging sample of very large dimension like fresco substrate, a NDT technique based on an Enhanced Compton spectrometer (ECOSP) is proposed. The underlying principle is to use the synergic effects of both the apparatus physical design and the data processing management in order to obtain an improvement in the efficiency in photons collection and information retrieval. It is well known that Compton scattered radiation, produced by unpolarized incident photons, has a circular symmetry around the direction of the incident beam . This means that the Compton cross-section do not change along the circular path determined by the rotation of the plane defined by the direction of incident photons and the scattering angle q . This characteristic was used here to develop an experimental assembly having an axial symmetry. As shown in the layout of Fig.1 the source and the detector was positioned on the same axis in an essential backscattering configuration (q » 160 degrees). The range of scattering angles, D q , determines an annular profile for the detector collimator and, as a consequence, all the photons having a scattering angle within D q may be detected. The invariance of the Compton cross-section, and the large area of the detector collimator, strongly enhance the number of detected photons. Fig 1: Layout of the axial symmetric configuration. D: detector; S: shielded source; L: tested layer; Dq: annular collimator. Fig 2: Test on sample of increasing thickness. The axial symmetric assembly consists of a large-area NaI(Tl) scintillation detector (40 mm diameter).A point source (2 mm diameter) of 241Am emitting 59.54 keV photons is posed in a cylindrical shielding head at the center of the detector. In this configuration, the sensitive volume is approximated by a cylinder - 3 mm diameter - entering the sample for all its depth. The annular shape of the detector collimation, is a consequence of the source head position and a further circular shield. A thick layer of Plexiglas (6x6x1cm3), with a circular central hole (6 mm diameter), was used to simulate a sample with homogeneous composition and a density variation in a limited volume. By this phantom the ECOSP efficiency in finding the presence of a void at different depth was tested. In order to evaluate the sensitivity of the experiment to density variation, some experimental situations have been considered. The background radiation coming from 25 voxel sited linearly 1 mm one from another has been measured from layer 1 in Fig.2. Then, two further layers of Plexiglas (each of them 1 cm thick) were added, and the scanning repeated independently for each of the new sample configuration. An analogous experiment was then repeated placing the layers 2 and 3 before the layer 1, and, finally, with the layer 1 in central position. Another series of experiments was performed on a phantom simulating inhomogeneous materials, where the presence of elements of different atomic number was provided by introducing in the central hole a small cylinder of Aluminum or Brass. In the following discussion, the scattered photons coming from scanning done on the Plexiglas, eventually in the presence of the central hole, will be referred as the background, while the scanning results in the presence of Aluminum, and Brass, as signal. This redistribution of variance is important in information recovery; indeed, since the PCs are uncorrelated, and each yj has variance less than the previous components, few PCs would contain a larger percentage of total variance. In other words, it is expected that, for a layer with homogeneous composition, with o without density variation, a very large fraction of the total data variance be described by a single PCs. On the contrary, the presence of insertions with different atomic numbers would induce two kinds of data variation: i) the backscattering photons coming from region with uniform composition, and ii) the phtons coming from the reduced number of SVs containing materials of different elemental composition. This complex structure of the matrix, Cx, would results (Eqn.2) in the presence of two relevants terms, two PCs, discribing the larger fraction of total variance. Fig 3: Density profile measurements. A. Estimate of Thickness effects. As previously outlined, the backscattering configuration gives raise to cylindrical SVs entering the sample, whose dimensions along the central axis are limited by the depth of the sample itself or, more properly, by the mean-free-path of the source-emitted photons. Therefore, in a sample of high thickness, the increased number of backscattered photons from deep layers may, in principle, attenuate the difference in the total backscattering arising from regions belonging to layers near the surface. At the same time, the presence of flaws and insertions in a deep layer could be masked by photons scattered in superficial layers. The experimental configuration adopted for the first series of trials is shown in Fig.2. The total number of backscattered photons detected, in order of increasing thickness, are shown in Fig.3A to 3C. The continuous line is the background density profile calculated from Eqn.1 where only the first PC has been taken into account (corresponding to about the 75 percent of the total variance). The PCA was carried out on all the seven scanning. At increasing depth, the total number of detected photons increases in a not-linear way, and - as clearly shown by the measured data - at 3 cm thickness the presence of the central hole is masked by the statistical fluctuations (see Fig.3C). In Tab.1 a comparison between the seven experiments is shown, where the first column indicates the position of layers 2 and 3 with respect to the inspected layer. All the data comes from the density profile reconstructed by the first PC. In all the experiment, the baseline values show that the number of backscattered photons increase when the sample thick augments; moreover in the experiment identified as Before, appears the greater backscattering. The former result is a consequence of the increased SV dimension; the later may be explained, at all the sample thickness, by the relative position of the inspected layer with respect to the profile of the detector solid angle. The difference, D , between the value at the baseline and at the peak was used to test the efficiency of the ECOSP to estimate the density variation at increasing thickness. It appears evident that the value of D decreases at increasing thickness, but for a radiation path-length up to the radiation mean-free-path, a correct evaluation of the density profile is still possible. Finally, as shown in Fig.3, the dimension of the central hole, evaluated in terms of width at half maximum, is correctly evaluated at each thickness an for all the experimental configuration. Table 1: Comparison between background estimate in sample of different thickness. Further insight on the sensitivity of the ECOSP may be obtained by inspecting the data in Fig.3. It is worth noticing that, at all of sample thickness, the background profile exhibits the same behaviour in every measurements all the seven experiment. This finding is noticeable considering that the shape delineated by the first PC has the higher SNR for the data under testing ; i.e. the common fluctuation pattern in all the profiles may really represent local density variations, made evident by the PCA. The capability to distinguish in a thick layer the presence of elements with a different atomic numbers, in term of two PCs only, characterising the signal and the background, respectively, has been verified by performing a new series of experiments on layer 1 alone. The background has been evaluated by collecting the photons coming from 9 voxels at 3 mm apart in the Plexiglas layer; two experiments, with and without the presence of a flaw, the Void and Plexiglas scanning, respectively, have been carried out. The signal was obtained by two more trials, where a small cylinder (6 mm radius and equivalent high) made of Aluminium and Brass, respectively, was inserted in the central hole. The total number of backscattered photons obtained in each experiment are shown in Fig.4, where the voxel position for Void was shifted for clarity. At first inspection the scanning with the insert of Aluminium in easy to find, because of the increase in total backscattering. On the contrary, the Brass insert may be easily confused for a big hole. Fig 5: PCA description elemental composition of the layer (see text). In order to better understand the results, some detail on the physical involved processes are to be introduced. Since a thick sample is concerned, in correspondence of each voxel the backscattered photons are produced by twofold action: that due to the electronic density, re, and that relevant to the attenuation factor, m . Each of them acts, respectively, increasing and decreasing the total backscattering contribution. The backscattering photons detected during the 'Plexiglas' scanning show a constant value, within the experimental errors, since both re and m , remain unchanged. Correspondingly, the drop of re, makes clear the reduction in total backscattering observed in the 'Void' scanning. Finally, the scanning profile obtained with the Aluminium and Brass insertion may be immediately understood if we consider that, for the former the increase of re is slightly prevalent with respect to the increase of the attenuation, and viceversa for the later measurement where the increase of the m coefficient strongly predominates onto the increase of re. As for the possible correlation, Cx , between data coming from adjacent voxel, the action of the PCA in discriminating regions with different elemental composition is evident. In the scanning performed on regions with homogeneous composition (Plexiglas or Void) the occasional drop of electron density, re, does not modify the correlation between the total backscattering coming from the SVs, even if density variations are present. This means that the background scanning may be described by means of a single PC, while the drop in total backscattering is taken in account (Eqn.1) by the changes in the elements of the 'loading' vector, u1 . Otherwise, when the variation in the number of backscattered photons is due to the presence of heterogeneous elements, the concurrent variation of both re and m produces correlations on some entries of Cx and, as consequence, the variation of the data set must be described in the right-hand-side of Eqn.2 by means at least two relevant eigenvalues. The result of the PCA applied to the four scanning are shown in Fig.5. In panel A the pixel density image obtained by the raw data is shown, where in the scanning 2 and 4 the backscattered photons obtained in the presence of the Aluminium and Brass insertion, respectively, are show. In panel B, the density image obtained by the reconstruction with the first PC alone is shown and, as evident, the only evident variations belong to the 'Aluminium' and 'Brass' scanning. Finally, the backscattering photons corresponding to the 'Plexiglas' and 'Void' scanning, respectively, are shown in panel C, as obtained by reversing the Eqn.1 with the second PC alone. 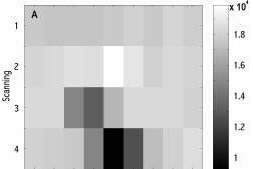 In all the density image the variations with respect the background level are shown. It is important to highlight the ability of the PCA, in describing the correlation between adjacent SVs. Indeed, while in the Brass scanning the high value of correlation, cxij , between the voxel 3 to 7 might be deduced directly from Fig.4, the same is not true for the 'Aluminium' scanning where the small variation in total backscattering and the presence of noise make difficult any inference about the dimension of the insert. Conversely, from panel B and C the similarity between the dimension of the flaw in 'Void', and the dimension of the inserts of Brass and Aluminium may be easily deduce. In the linear model describing the heterogeneous composition of the tested sample, Eqn.1, the first PC ( the l 1 value) gives reason of about the 80% of the total variation, and the second PC, the l 2 value, of about the 17%, thus providing an explanation of the strong correlation between the neighbouring voxels, induced by the presence of Brass and Aluminium. The preliminary results described in the present paper shown that the ECOSP technique here introduced may represent a useful approach to describe the distribution of electron density in hidden layer of large size dimension. The new experimental design developed in this work, based on a detector collimator of circular shape, permits to describe the density distribution of the layer still maintaining a voxel-by-voxel scanning; i.e., gives a punctual description of the sample and, at the same time, strongly reducing the duration of measurement. Indeed, the inspected SV as delimited by this configuration make possible to describe the density distribution of the tested layer by principally collecting photons that reach the detector after a single Compton collision. The data analysis based on the PCA, permit to highlight the correlation between neighbouring SVs, so that the density profile of an homogeneous material might be described with a single PC. Moreover, it has been shown that is possible to directly imaging the elemental composition of a heterogeneous layer in terms of a binary compounds; i.e., by a first PC describing the density of the background materials and a second PC showing the presence of elements with a different atomic number. R.S. Yacout, M.H. Van Haaren and W.L. Dunn, "A limited-scan backscattering technique for detection of hidden corrosion", Appl. Radiat. Isot, vol. 48, 1313-1320, 1997. R. S. Holt, M, J. Cooper and D.F. Jackson, "Gammay-Ray scattering techniques for non-destructive testing and imaging", NIM Phys. Res., vol. A221, pp 98-104, 1984. E.M.A. Hussein and T. J. Whynot, "A Compton scattering method for inspecting concrete structure", NIM Phys. Res., vol. A223, pp 98-104, 1989. A. Tartari, J. E. Fernandez E. Casnati, C. Baraldi, "New EDXRS exploitation of Compton Scattering Properties", X-Ray spectrom., vol. 24, 167-173 (1995). S. K. Mullin and E.M.A. Hussein, "A Compton-scatter spectrometry technique for flaw detection", NIM Phys. Res., vol. A353, pp 663-667, 1994. Ready, P.J. , Wintz, P.A., Information Extraction, SNR Improvement, and Data Compression Imagery, IEEE Trans. On Communication, vol 12 1123-1130,1973. Jackson, J.E., "A user Guide to Principal Components", Wiley Interscience, 1991.